Orbiting high above dwarf planet Ceres, the spacecraft is healthy and performing all of its assignments successfully even when confronted with what appears to be adversity. 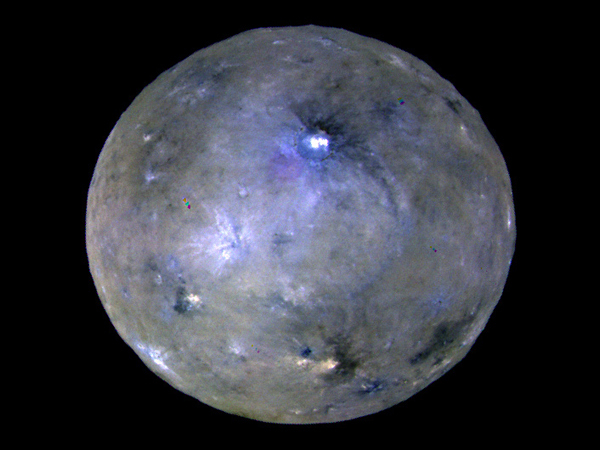 In the last four Dawn Journals, we described the ambitious plans to maneuver the craft so it would cross the line from the sun to Ceres on April 29 and take pictures plus infrared and visible spectra from that special perspective. With Dawn between the sun and Ceres, the alignment is known as opposition, because from the spacecraft’s point of view, Ceres is opposite the sun. As explained in March, those opposition measurements may provide clues to the nature of the material on the ground with much greater detail than the camera or other sensors could ever discern from orbit. The veteran explorer carried out its complex tasks admirably, and scientists are overjoyed with the quality of the data. 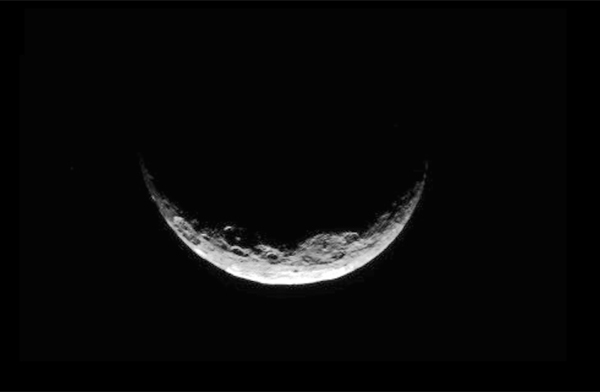 The flight team had worked out a plan to provide a backup opportunity to study Ceres at opposition on June 28. The results of the April 29 observations are so good, however, that the backup was deemed unnecessary and so has been canceled. In this phase of Dawn’s mission, the highest priority continues to be recording cosmic rays so scientists can improve their measurements of the atomic constituents down to about a yard (meter) underground. Dawn’s latest success followed less than a week after what might have seemed to some people to be a very serious problem. Indeed, in other circumstances, it could have been devastating to the mission. Fortunately, the expert team piloting this spaceship was well prepared to steer clear of any dire scenarios. On April 23, reaction wheel #1 failed. This was Dawn’s third incident of losing a reaction wheel. (In full disclosure, the units aren’t actually lost. We know precisely where they are. But given that they stopped functioning, they might as well be elsewhere in the universe; they don’t do Dawn any good.) Reaction wheels are disks that spin to help control the orientation of the spacecraft, somewhat like gyroscopes. By electrically changing a wheel’s speed (as high as 75 revolutions per second), the spacecraft can turn or hold steady. We have discussed Dawn’s reaction wheels many times, and reaction wheel enthusiasts are encouraged to review the detailed history by rereading the last 275,000 words posted. But because this is the last time we will ever need to discuss them, we will summarize the entire story to its conclusion here. The flight team was able to overcome the loss of the two reaction wheels, even though that had never been planned for (nor even considered) when the spacecraft was being designed and built. It required not only a great deal of work but also exceptional ingenuity and diligence. That heroic effort paid off very handsomely in allowing the spacecraft to continue its ambitious deep-space expedition, trekking for 2.5 years from Vesta to Ceres and then conducting a comprehensive study of that dwarf planet, the first one humankind had ever seen. Dawn exceeded all of its goals and successfully concluded its prime mission in June 2016. And even with the malfunctions of two reaction wheels, the team kept the spacecraft so healthy and productive that it is now conducting an extended mission, gathering even more riches at Ceres. There was no basis for predicting when another wheel would fail, but it was widely considered to be only a matter of time. Because the four wheels are of the same design, and some had failed on other spacecraft as well, confidence that the two remaining wheels would function for long was low. Indeed, your faithful correspondent, in his technical role on Dawn, occasionally referred to the "two failed wheels and two doomed wheels." When the spacecraft reported on April 24 that another wheel had failed, no one on the team was very surprised. In fact, the biggest surprise was that the two doomed wheels had continued to operate as long as they did after the other two stopped. The strategy for recovering from each of the two earlier failures and preparing for another was complex and multifaceted. Let’s recall just a few aspects. Dawn carries a small supply of conventional rocket propellant called hydrazine, expelled from small jets of the reaction control system. (Yes, Dawn has a full set of backup jets.) The reaction wheels occasionally need a little bit of hydrazine help, and that is why the reaction control system is onboard. (For propulsion, it is far less efficient than the ion propulsion system, and Dawn has never used hydrazine for that purpose.) In principle, the reaction control system could do the job of the reaction wheels, but that would require a great deal more hydrazine than Dawn carried when it left Earth. Indeed, the reason for reaction wheels is that they control the orientation for much less mass. Well, to be more precise, they control the orientation when they work. When they fail, they don’t do as well. The flight team invested a tremendous effort in stretching the hydrazine so it could be used in place of the wheels, and that has proven to be extremely successful. 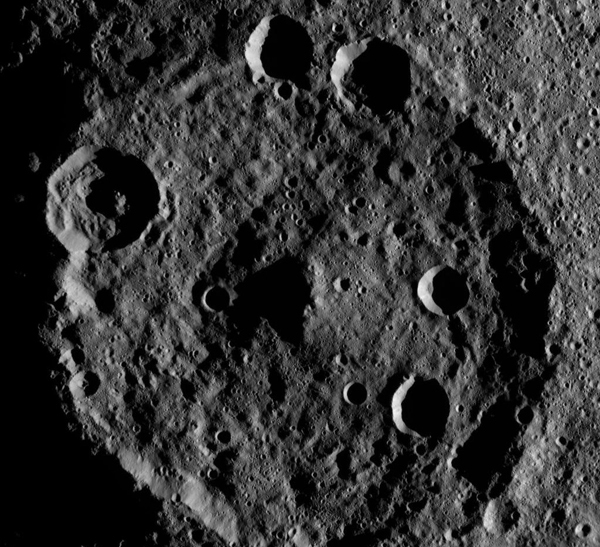 In fact, Dawn arrived at Ceres ready to complete its mission here with zero wheels in case a third wheel was on the verge of failing. The amount of hydrazine Dawn uses depends on its activities. Whenever it fires an ion engine, the engine controls two of the three axes, significantly reducing the consumption of hydrazine. In orbit around Vesta and Ceres, the probe often trains its sensors on the alien landscapes beneath it. The lower the orbital altitude, the faster the orbital velocity, so Dawn needs to turn faster to keep the ground in its sights. Also, the gravitational attraction of these massive worlds tends to tug on the unusually large solar arrays in a way that would turn the ship in an unwanted direction. (For more on this, see here.) That force is stronger at lower altitude, so Dawn needs to work harder to counter it. 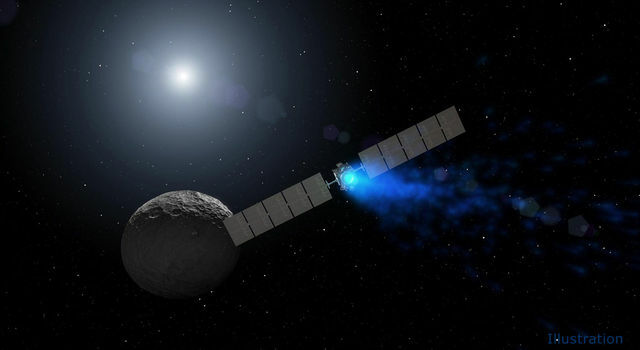 The consequence is that Dawn uses more hydrazine in orbit around Vesta and Ceres than when it is journeying between worlds, orbiting the sun and maneuvering with its ion engine. And it uses more hydrazine in lower orbits than in higher ones. Following the first reaction wheel problem, mission controllers decided to hold the wheels in reserve for the times that they would be most valuable in offsetting hydrazine use. From August 2010 to May 2011, the spacecraft flew with the one failed wheel and the three healthy (but doomed) wheels all turned off. As it approached Vesta, controllers reactivated the three wheels, and they served well for almost all of Dawn’s work there. The second malfunction occurred in August 2012 as Dawn was ascending on its departure spiral, and the spacecraft correctly deactivated all of them and reverted to hydrazine control even before radioing the news to distant Earth. 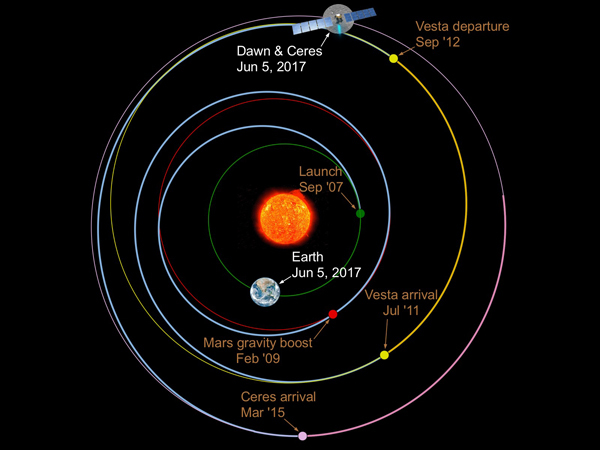 The wheels had been scheduled to be turned off again shortly after Dawn pulled free of Vesta, so the team decided to leave them off then and complete the escape without reaction wheels. 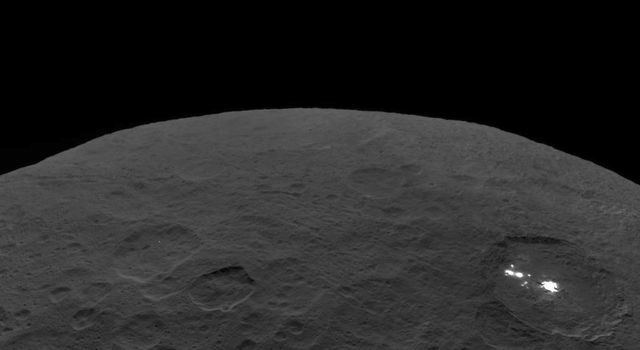 They were not used again (except for four brief periods) until 1.2 billion miles (1.9 billion kilometers) later, in December 2015, when Dawn reached its lowest altitude orbit around Ceres. 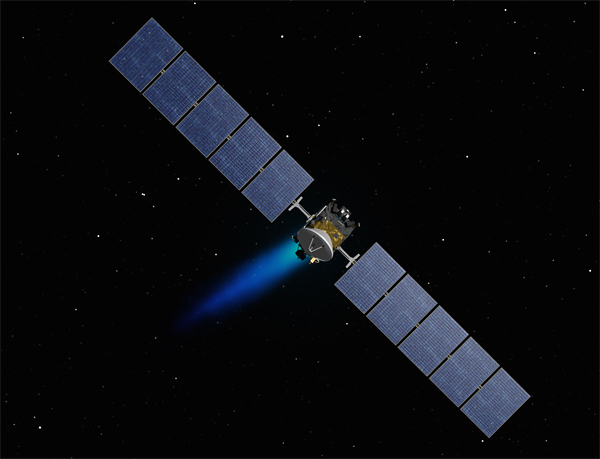 At Ceres, of course, only two reaction wheels were operable, and Dawn was not designed to use fewer than three. But the day after the first reaction wheel problem occurred in 2010, engineers at JPL and Orbital ATK (back then, it was Orbital Sciences Corporation) began preparing for another failure. They started working on a method to control the orientation with two wheels plus hydrazine, a combination known as hybrid control. That would consume less hydrazine than using no wheels, although more than if three wheels were available. 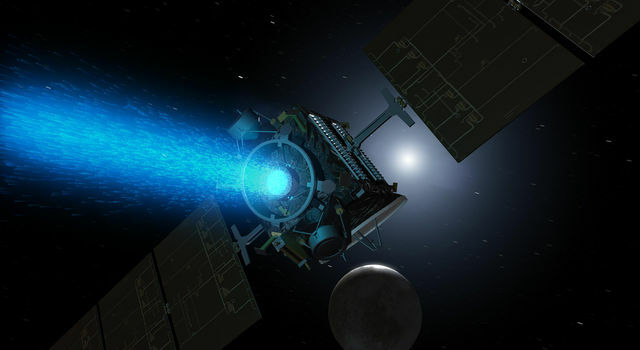 Following an unusually rapid development of such complex software for a probe in deep space, the team installed the new capability in Dawn’s central computer in April 2011, shortly before Vesta operations began. That software performed flawlessly from December 2015 until the third reaction wheel failed last month. The team determined in 2010 that the benefits of operating the spacecraft with only one wheel would not justify the investment of effort required. So now that three have failed, the last operable wheel is turned off, and it will never be used again. But as we saw above, the team has a great deal of experience flying Dawn with no wheels at all. They had piloted the ship in that configuration through the solar system and around Ceres for a total of four years, so they were well prepared to continue. With the third wheel failure, we can be grateful that each wheel provided as much benefit as it did. The wheels allowed Dawn to conduct extremely valuable work while using the hydrazine very sparingly. Now that we are finished with the wheels, the members of the flight team are not despondent, dear reader, and you shouldn’t be either. Dawn can continue to operate until the hydrazine is depleted or some unforeseen problem arises. But risks are the nature of venturing into the forbidding depths of space. For now, Dawn has life left in it. Next month we will describe the plans for using the remaining hydrazine. Less than a week after the third reaction wheel failed, Dawn performed perfectly in collecting all of the planned pictures (using both the primary camera and the backup camera) as well as visible spectra and infrared spectra at opposition. Reaching that special position on the line from the sun to Ceres required two months of intricate maneuvers. By coincidence, another special alignment occurs very soon. This one is called conjunction. Earth and Ceres follow independent orbits around the sun. Earth carries with it the moon and thousands of artificial satellites. The dwarf planet has one companion, a native of Earth, a temporary resident of Vesta and a resident of Ceres since March 2015. Because Earth is closer to the sun than Ceres, it is bound by a stronger gravitational leash and so circles faster. Early next month, their separate orbital paths will bring them to opposite sides of the sun. From the terrestrial perspective (shared by some readers, perhaps even including you), the sun and Ceres will appear to be at the same location in the sky. This is conjunction. Communicating with distant interplanetary spacecraft is not easy. (Surprise!) It is even more difficult near conjunction, when the radio signals between Earth and the spacecraft travel close to the sun on their way. The solar environment is fierce indeed, and the stormy plasma that surrounds the star interferes with the radio waves, like hot, turbulent air making light shimmer. Communications will be unreliable from May 31 to June 12. Even though some signals may get through, mission controllers can’t count on hearing from the spacecraft or contacting it. But they are confident the stalwart ship will manage on its own, executing the instructions transmitted to it beforehand and handling any problems until Earth and Ceres are better positioned for engineers to provide any help. Occasionally Deep Space Network antennas, pointing near the sun, will listen amid the roaring solar noise for Dawn’s faint whisper, but receiving any crackling messages will simply be a bonus. In essence, conjunction means radio silence. Dawn’s proximity to the sun presents a convenient opportunity for terrestrial observers to locate Dawn in the sky. On June 5-6, it will be less than one solar diameter from the sun. Ceres does not orbit the sun in the same plane as Earth, so it does not always go directly behind the disk of the sun. The spacecraft and dwarf planet will be a little bit south of the sun. If you hold three fingers (preferably your own) together at arm’s length and block the sun any time from June 1 to 10 (and you are encouraged to do so), you will also cover Dawn. From June 3 to June 8, you can cover the dazzling celestial signpost and Dawn at the same time with your thumb. Dawn is very big for an interplanetary spacecraft (or for an otherworldly dragonfly, for that matter), with a wingspan of nearly 65 feet (19.7 meters). However, it will be 346 million miles (557 million kilometers) away during conjunction, more than 3.7 times as far as the sun. Those who lack the requisite superhuman (or even supertelescopic) vision to discern the fantastically remote spacecraft through the blinding light of the sun needn’t worry. We can overcome the limitation of our visual acuity with our passion for exploring the cosmos and our burning desire for bold adventures far from home. For this alignment is a fitting occasion to reflect once again upon missions deep into space. There, in that direction, is Earth’s faraway emissary to alien worlds. You can point right to where it is. Dawn has traveled more than 3.8 billion miles (6.1 billion kilometers) on a remarkable odyssey. It is the product of creatures fortunate enough to be able to combine their powerful curiosity about the workings of the cosmos with their impressive abilities to wonder, investigate, and ultimately understand. While its builders remain in the vicinity of the planet upon which they evolved, their robotic ambassador now is passing on the far side of the extraordinarily distant sun. This is the same sun that is more than 100 times the diameter of Earth and a third of a million times its mass. This is the same sun that has been the unchallenged master of our solar system for more than 4.5 billion years. This is the same sun that has shone down on Earth all that time and has been the ultimate source of much of the heat, light and other energy upon which residents of the planet have depended. This is the same sun that has so influenced human expression in art, literature, mythology and religion for uncounted millennia. This is the same sun that has motivated impressive scientific studies for centuries. This is the same sun that is our signpost in the Milky Way galaxy. Daring and noble missions like Dawn transport all of us well beyond it. 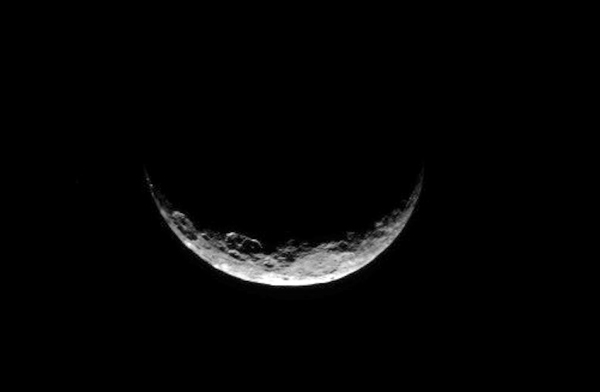 Dawn is 31,600 miles (50,800 kilometers) from Ceres. It is also 3.72 AU (346 million miles, or 557 million kilometers) from Earth, or 1,555 times as far as the moon and 3.68 times as far as the sun today. Radio signals, traveling at the universal limit of the speed of light, take one hour and two minutes to make the round trip.